A twitter chat really does do what it says on the tin. Its a chat, that happens on twitter. You would of never of guessed? At a select time of the day, by using a certain hashtag someone will be asking questions and you can simply answer the questions and if you want chat and reply to other peoples answers or questions. Its really quite simple! Don't worry you don't have to go through rigorous testing or any exams. You simply turn up! If only all exams were like that, eh? Find out a twitter chat topic that suits you, find the hashtag and what times it is on and simply start tweeting using that hashtag. Its really good to start of by saying hello or asking everyone if they are okay, that sort of thing. WHAT TWITTER CHATS ARE AVAILABLE? well, my good friends, here is a list that I have compiled of all the blogging twitter chats available. Obviously you are not going to be able to take part in every single one of these twitter chats but after a bit of trail and error, you will find the ones are are suitable for you! 8-9pm #fblchat:. For fashion, beauty and lifestyle bloggers. #bloghour: 9-10pm. For all bloggers. 8-9pm. #bdib: For all bloggers. HOW DO I PICK THE RIGHT BLOGGING CHAT FOR ME? This really does depend on you and what sort of blogger you are. I wouldn't go and take part in a beauty chat if you know little about beauty because you won't be able to answer the questions properly and won't be able to interact with as many bloggers. Another point to consider if you are new to blogging chats is the size of the chat. Some are very small with only a small selection of bloggers taking part whereas some could have a couple of hundred people involved. I would start small if you are nervous. 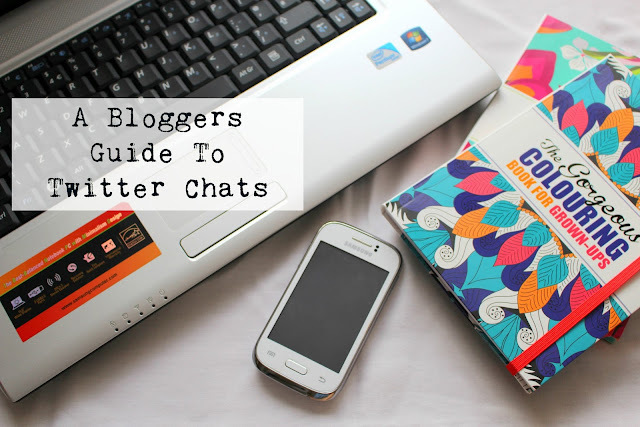 WHAT ARE THE BEST BLOGGING CHATS? WHAT DO I DO IF I HAVE ANY TROUBLE? I personally have never had any trouble with anyone because everyone is so kind and welcoming. However if someone is making the twitter chat unpleasant for you, you can simply put them on mute or you could leave the chat. Twitter chats are a way of congregating with other bloggers who have similar interests as you, NOT to start a world war 3. WHAT DO I DO IF I FEEL IGNORED? In some blogging chats like lifestyle bloggers, it can get quite busy and almost over crowded with people. The host will not be able to reply to every single comment they receive so don't worry if they don't reply to yours. If you see something that someones tweeted that you have something to say about, reply to their tweet and start a conversation. Before you know it, a couple more people may have joined in and you have a nice little discussion going on. HOW DO I MAKE FRIENDS IN BLOGGING CHATS? If you participate for a while you will see the same bloggers appear in quite a few of the chats. If you see someone that you have talked to before, go and say hi again, I am sure they would want to hear from you. Make sure you follow people as you are going along. You never know, they might follow back? WHAT ARE THE REAL BENEFITS OF BLOGGING CHATS? Being a regular participator in blogging chats is a fantastic way of feeling part of the blogging community. I have made friends while taking part in blogging chats and now we regularly talk to each other and send each other things, its really good fun. Another great aspect is at the end of most of the blogging chats, you can share your links. This is a great way to find new blogs to read and love but also a good way to get other bloggers directed to you. THINGS TO AVOID IN TWITTER CHATS? Blogging chats can move very fast. It sometimes can be hard to keep up if the host has a lot of questions. Take your time and don't forget to comment and reply to others tweets to get involved in the conversation. Try to be there for the start, I always feel more settled in that way but if you can't, don't worry you can join in at anytime, they will be happy to have you. Be friendly and kind as always and remember if you don't have anything good to say, don't say anything at all! I think I have covered just about everything. If you have any more points that I did not cover please leave your questions in the comments or send me a DM and I will get back to you. I totally agree with all of your points! Twitter chats are amazing to connect with other bloggers and share your own blog. I love joining them and I feel that blogging would be a different experience without them! I have never took part in a twitter chat, I always forget they are happening then miss them, but they sound so interesting! I love twitter chats so much they are usually the highlight of my night and I have made a few friends from taking part! Great post, now I have all the times and days! whoa fun! I've never participated but I want to look into it now! Thank you for the schedule! SO helpful, I've only ever done lbloggers and cbloggers! such a great informative post! I always forget the days and times of certain twitter chats so great to include it all in one post! Especially as there such great places to meet new bloggers!